Hi AMW friends! Yesterday was such a challenging day for me! I was all positive of sorts in the earlier week but I was woken up around 5am because my son was sick with fever and he has diarrhea (sorry to those who are eating as of the moment). Now I understand what most of my mommy friends would say: "It hurts even more for mommies!". Setting all worries aside, (well trying to), the show will go on and I will share my review of the newest multi-tasking product I received from Mary Kay Philippines. The Mary Kay At Play Shadow & Liner comes in a double-sided "twist-able" packaging. One side is the colored shadow while the other side works as a liner. Available locally in 3 shades: Rebel Rose, Mint to Be and Iced Lilac. I got Rebel Rose for review. And a plain matte black "crayon like" eyeliner on the other side. Rose shadow and black liner works perfectly for daily use. The liner has good pigmentation. One swipe gives you a good color but 2 swipes gives the perfect opaque shade. The shadow is very natural. Works as eyeshadow base too! The cream shadow sets into powder finish thus I don't have to worry about creasing. (Not unless you have extremely oily lids). The eyeliner will smudge or transfer especially on monolids or hooded lids if not set properly. Mary Kay does not have a stall or store, you can't test the shades or product in person. I believe these are limited edition so if you like these so much, you may not see them again. Packaging, it is easy to "ruin" the eyeliner or shadow stick when you don't return the cap gently. Eyeliner may most-likely smudge if applied on waterline so please set properly with translucent powder or eyeshadow. For day time look, use the shadow side and apply all over "mobile lids" and blend edges. For more intensity, add a similar shade powdered eyeshadow to "set". For night time look, use the eyeliner side as an eyeshadow base (photo-torial below). Best to apply both side directly and not use any brush. Apply liner always closest to the lashline to make lashes appear full. Be careful in re-placing both caps as you may "hit" the product. If you have extremely oily lids, set the liner with a powder or use an eye primer. Do not "over twist" the product a the stick may fall off from the packaging. The Mary Kay at Play™ Dual-End Shadow & Liner is priced at Php725.00 (approx $16.50). Rebel Rose on the left side and Black Eyeliner on the other side. 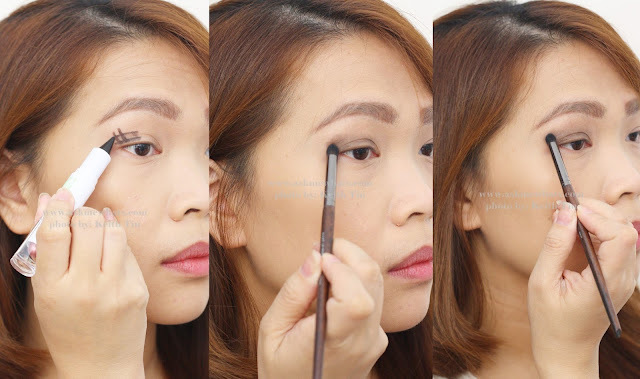 The sharpened tip of the liner makes it easy to apply thin line. As written on "tips" portion above, if you want to create more "drama", feel free to use the liner side of the stick as an eyeshadow base. Check out how I do it and you may build intensity by adding another layer. Feel free to use the sharp portion of the liner to create thin eyeliner. The liner can also be applied on the waterline. Again, don't forget to set it with powdered shadow or translucent powder. On to Rebel Rose, it is a gorgeous "Rose" shade with a nice sheen finish. I like to use this product on it's own or "set" with a similar eyeshadow powder. Since my lids are dry, I can get away by applying just this and a liner. The effect is super sweet and romantic. BUT, if you didn't let the liner set properly and blinked, you'll see this! So this gave me an impression that the liner is not as smudge-proof and smear-proof as we would like it to be. Oily-lidded users who own this product, PLEASE use an eye primer! A grungy night time look on left eye (facing you) and a sweet, daytime look on right eye (facing you). I actually enjoyed using this product! I can create simple make-up especially for women-on-the-go with just this 1 product. How do you like the new Mary Kay at Play™ Dual-End Shadow & Liner? Any other similar brand that works the same? Let me know as I'd love to check other options. That looks like a good thing to have around when you're always on the go! Great product and review! thanks for commenting and yes, this is a great multi-tasking product!